Robot Fan - NES R.O.B. 's Twin Brother? Chicago has been hot the past few days. Damned hot. I'm not a big fan of the heat, usually jumping into Lake Michigan to cool off - but the Lake is still too cold to swim in. The only thing left to do is crank up the AC and play video games all day, right? We survive thanks to window air conditioners augmented by a few fans, arranged using my rather tenuous grasp of physics. I used to use old and stylish finger-chopper metal fans, but they eat a ton of electricity as well as the tips of noses. Today we use some pretty mundane plastic fans for circulation - novelty fans just don't seem to work very well (Ask me to tell you about the pedestal fan I bought that isn't UL listed. Scary...). One notable exception is the robot fan above. It's a quite nice oscillating fan like one that you might have on your desk, but this one has robot arms and light-up red eyes (but wait... doesn't the heat from the eye-bulbs negate some of the cooling effect of the fan, and... oh, forget it). Any 80's video game fan will recognize that the fan's design is a complete rip off of the Nintendo Robotic Operating Buddy - R.O.B. for short. R.O.B. 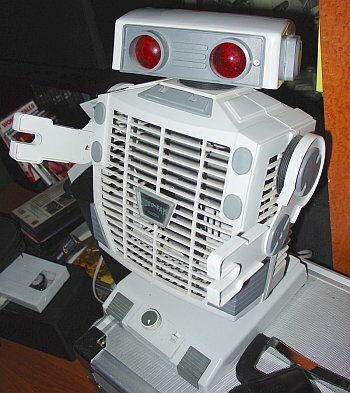 was an unsuccessful add-on robot to the NES, though clearly iconic enough to rip-off for a cheap desk fan. In sniffing around on the net for info, I found that this fan was also used for a movie promotional giveaway for "Short Circuit". Robo-Fan got around, it seems. Here's a heads up for Retro Thing readers around the world. International Home Movie Day is coming on August 12th. On this day, sites all around the globe are hosting get togethers for people to bring in and watch home movies. It's easy. Just rummage around in your parents' closets to find the old home movies. Bring them to your local HMD site, and they could be included in the evening's screening. Home Movie Day is terribly fun, even if you're not as alarmingly into other people's home movies as I am. I go to the Chicago one myself, and I bring along a pile of 1950's records that are intended to play along with home movies. It's incredibly fun to see how these randomly selected records and randomly selected movies sync up! 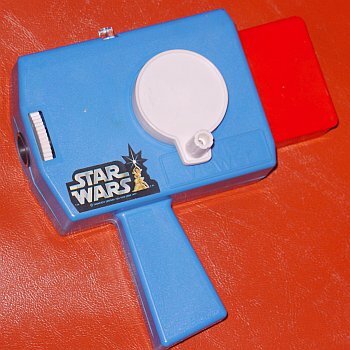 In the week leading up to Home Movie Day we'll have daily posts discussing some home movie related retro things, right up to the big day. Please write in and let us know if you're going to join your local HMD fun. It would be great if some of you Retro Thing readers got to hang out, right? 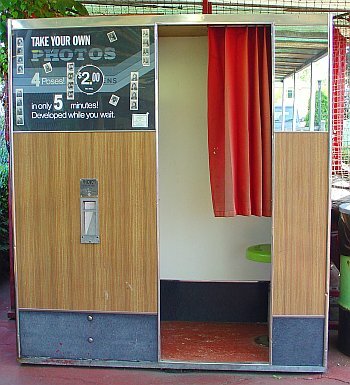 I used to see photo booths at countless amusement parks, shopping malls, and cheapie department stores. Photo booths had a practical purpose, allowing you to easily and quickly get an ID picture for a train pass or similar, but we all know what's really involved... you want to cram in as many people as possible to take silly pictures. For those who might not have experienced this, you slink into the booth, draw a curtain, then use the reflection in the camera's glass to check out your mug. Four poses and four flashes later (okay - I'm being poetic... the process takes five minutes), the machine spits out a strip of film with your pics. I know that today there are photo sticker booths that are completely digital. You can pick from a bunch of novelty borders, draw on mustaches, etc. Okay - crummy camera plus inkjet printer, everyone gets that. Considering that the photo both is from well before the digital age, the technology is kind of amazing. It is actually a chemical process that really runs your film through tanks of juice the old fashioned way. Outdoor photobooths like the one pictured require adjustment throughout the day as the outside temperature changes. I'll give it to the digital photo booths of today for being somewhat more fun, but I'm glad that someone in the 1920's saw fit to brute force the technology of the day into an outdoor kiosk so that we can enjoy more than 75 years of funny photographs. 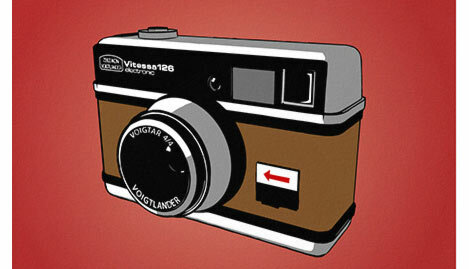 Minneapolis artist Sean Tubridy has created a must-see collection of retro camera prints. Each signed print measures 5 x 5 inches on a 9 x 9 matte. His work also includes some clever t-shirts and vintage transistor radio work. While he doesn't have an online shop, you can order via email/PayPal (contact sales at blueoverblue dot com for all the deets). News from the Classic Computer Magazine Archive: "July 27 will be the 10th anniversary of the archive. In celebration, today we're announcing that the site now offers the full text of 19 issues of ST-Log Magazine. This includes more than 600 articles and a gallery of the magazine's covers. ST-Log was devoted to Atari's 16-bit ST line of computers. 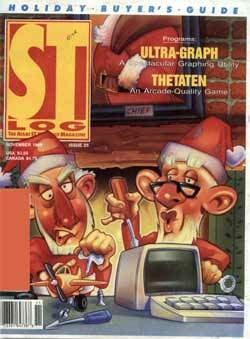 It began as an insert in ANALOG Computing magazine in 1986. It spun off as a separate magazine for about three years, before being folded back into ANALOG again in 1989." They've also added a cover image gallery for their online Compute! magazine collection. I wish they'd scan the ads, too. 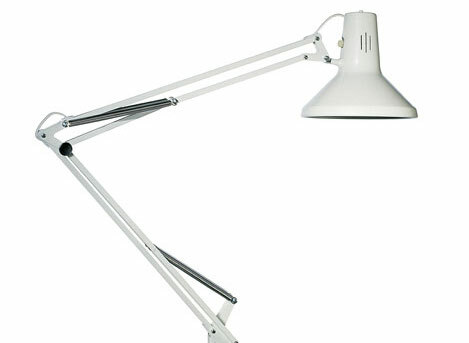 The much-imitated Luxo L1 luminaire was introduced in October 1938. It was based upon a British spring-balanced model that accompanied a shipment of sewing machines to Norway in 1936. Inventor Jac Jacobsen immediately saw its potential and licensed the design to create his elegant and practical design masterpiece. Over 25 million copies of this lamp have been manufactured and a computer-rendered version starred in Pixar's first animated short "Luxo Jr." Twenty years later, an energetic young Luxo is an integral part of the Pixar logo that appears before each of their films, although the modern movie version is wireless. OK, so it's a reproduction of a classic German design, but Brazil has long been the source of interesting automobiles thanks to import restrictions that encouraged the domestic auto industry. One of the most famous Brazilian sports cars of the 1970s and 1980s was the beautiful VW-based Puma, with sales of over 22,000 vehicles. 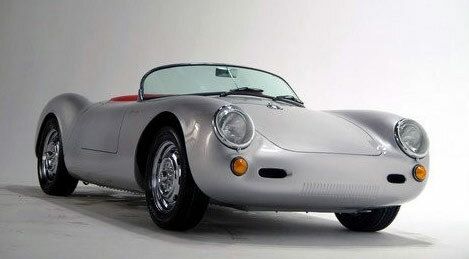 Puma co-founder Milton Masteguin now helms Chamonix, a small Brazilian car company that turns out reproductions of the famed Porsche 550 and 356 cars. The vehicles are based on designs by American Chuck Beck, offering a wonderful combination of old-fashioned good looks and modern engineering. My favorite is the beautiful air-cooled Chamonix 550. It's a derivative of Ferdinand Porsche's legendary race car that took the world by storm in 1953. This modern replica is built around a 3-inch DOM tubular space-frame chassis and is available in several configurations. $18,995 gets you a pre-assembled body package. It's pre-painted, with the doors and hood mounted and a full leather interior. A VDO instrument cluster is installed and all major wiring is complete. All you require to finish your car is the engine, transaxle, tires, fluids and approximately 30 hours of assembly time. The choice of powerplant is limited only by your sanity and the space within the rear engine compartment. A popular choice is a 1915 cc 4-cylinder VW-based engine that puts out 125 HP. It retails for $6,000 and is capable of propelling the vehicle from 0-60 mph in a respectable 5.8 seconds, with a top speed of 130 mph (209 kph). To top everything off (literally), the modern version includes a removable scissor-steel mechanism convertible top. Some of the most memorable arcade games from the 1980s are the hardest to emulate with modern raster-scan monitors. 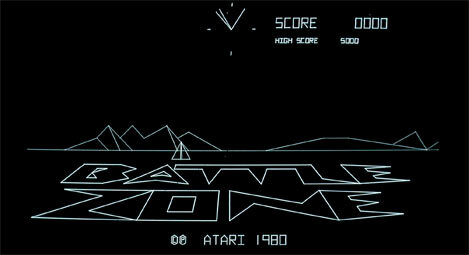 Smash hits like Asteroids, Tempest, Battlezone and Star Wars use vector graphics -- straight lines and dots -- to generate futuristic images that scroll smoothly across arcade displays. Here's a brief look at a vector generator that brings these razor-sharp classics into the 21st century. "There were more than 30 vector based games made in the 80's. To acquire a collection that includes all these games would be a monumental feat. Just to find that many vector monitors alone would be no easy task, not to mention the cost! Vector based arcade monitors haven't been made in 20+ years, and you can't simply use one vector monitor for all these games. Each monitor has different specs and runs at different speeds, making them incompatible between different gaming hardware. The hardware was unique for most of these games, making multigame conversion kits difficult to design. 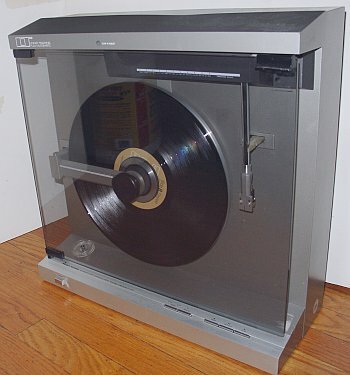 [until now]"
The audiophiles among you will probably cringe at the very thought, but here is a linear tracking turntable that plays records while upright. The unmistakable 80's styling is a reminder of the time when electronics manufacturers were trying to come up with new ways to market turntables, whose design had remained stubbornly horizontal for decades. It was the dawn of the CD, and records were rapidly losing out to the cassette. 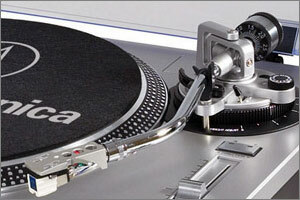 Manufacturers scrambled to keep LP's relevant and to find ways to make their playback more convenient. The Mitsubishi LT-640 is a fairly basic model, but some "new wave" turntables of the time had sophisticated features such as track programmability or two tone arms that could play both sides of an LP without flipping. Upright and drawer units were an attempt at making turntables take up less space (and were often made by lower end firms), and integrate better into the "entertainment centers" of the era. Of course, aesthetics should take a back seat to sound quality. This Mitsubishi doesn't sound too bad at all. I was a bit suspicious at the stylus being pushed into the groove by a spring, but the exerted pressure seems good enough that I didn't hear any distortion or any other audio problems. I think that a normal turntable is always going to sound better since every part of the LP manufacturing and playback process is designed with a regular old record player in mind. I got this table for $20 so I wasn't expecting audiophile quality, but let's face it... this novel turntable is all about looks. Or maybe this table will let you listen to records in a space where you couldn't set up a conventional record player. In any case, the fact that it sounds nice as well is the bonus that we'd all hope for. 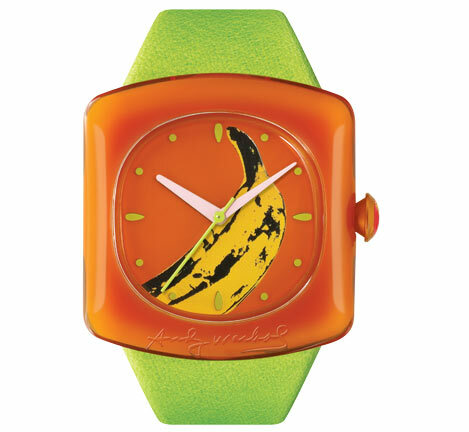 Seiko now sells a series of "reasonably priced" watches featuring Pop Art images by Andy Warhol. Prices range from $75 to $150. Of particular interest is the three watch "Campell's" pack, which features a trio of digital watches that riff on Warhol's seminal 1968 Campbell's soup can screenprint. My wife once asked why -- as a retro fanatic -- I don't own a vintage car. She was somewhat taken aback when I promptly started browsing 'for sale' ads in search of a nice low-mileage Ferrari. Had I known about Westfield's remake of the Lotus Eleven, chances are I would have started my hunt with a good look at these amazing machines as well. 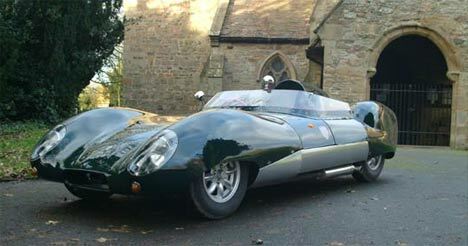 North American distributor Tom McClintock reports: "The Lotus Eleven was the most successful of the sports racing cars in the mid 1950s - a 1,000 lb Colin Chapman-designed space frame car, sporting a beautiful, aerodynamic body; the form of which was designed by aerodynamicist Frank Costin. The Eleven surpassed the earlier Lotus cars both in its competition success and number, with some 270 units produced through 1958." The Westfield XI is available in extremely limited quantities, starting at US$17,995. A 20% deposit is required to secure your name on the production list. 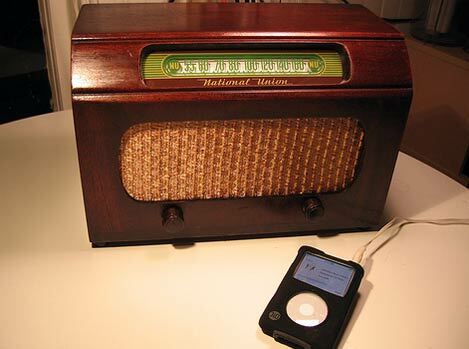 Here's a link to a flickr set full of pictures documenting the transformation of a vintage 1947 National Union G-619 table radio found at a flea market into an iPod amplifier. 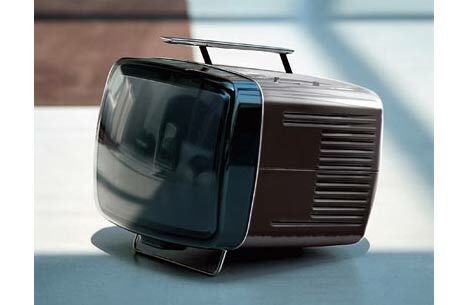 The sleek Brionvega Doney TV was designed by Marco Zanuso and Richard Sapper. It looks modern even by today's standards and won the prestigious Compasso d'Oro design award in 1962. A much-updated version of this brilliant classic is still available in the original shape and colors. The original was a simple PAL-format B&W portable, while the updated version offers a shadow mask color screen and compatibility with PAL and SECAM. A useful assortment of video and audio connections are included, too. I wish modern flat-screens had as much character, although € 699 is a bit steep for a 14-inch (36 cm) CRT. 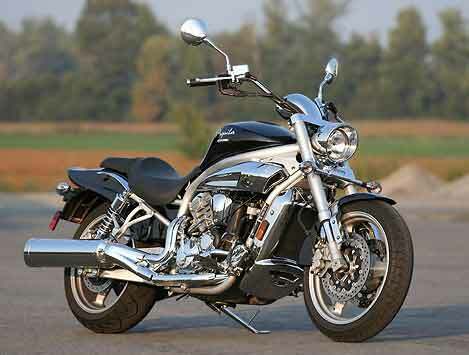 Korean motorcycle manufacturer Hyosung has been around since 1978. They entered into a technical manufacturing agreement with Suzuki a year later and now employ over 400 people, having shipped well over 2 million motorbikes and scoots to every corner of the globe. Their cruiser lineup is classic with a decidedly modern flair. They offer a wide range of engine displacements from the compact and fuel efficient GV125 to the competent GV650. The web site proudly proclaims that the 650 offers "Romantic sailing to make beautiful recollection." Somehow I doubt this two-wheeler is truly amphibious, though. Despite its old-fashioned looks, the GV650 features a shiny modern VFD digital instrument panel (with chrome trim) and a semi-permanent belt drive that is "three times superior" to a chain drive. I suspect all the company needs to become truly successful is a competent translator, although their product manuals are probably quite amusing. The GV650's 647cc V-twin powerplant puts out around 60 HP, which doesn't seem like much until you factor in that this shiny bike weighs a respectably low 220kg (dry). The MSRP is also a respectable low $8,795 Canadian. "The track is an odd place to test a cruiser, but then the GV 650 is not a standard issue offering and that’s because normally in cruiser land there is a high price of style; under the weight of chrome and leather, performance is quickly and thoroughly crushed. The recipe for a cruiser is a tried and true one, a torque laden v-twin engine, a relaxed foot forward chassis, comfortable all day ergonomics, and style. Hyosung has done up a proper cruiser in all these respects, and then they went on to mix it up a bit, like a modern martini versus a classic dry offering. The end result extends the class and amuses the rider’s pallet a lot more than the tried, tired and true cruiser mix."